The fifth Glion Human Rights Dialogue (Glion V), held in Chardonne, Switzerland, from 30-31 May 2018, considered the place of human rights in a modern, reformed United Nations. 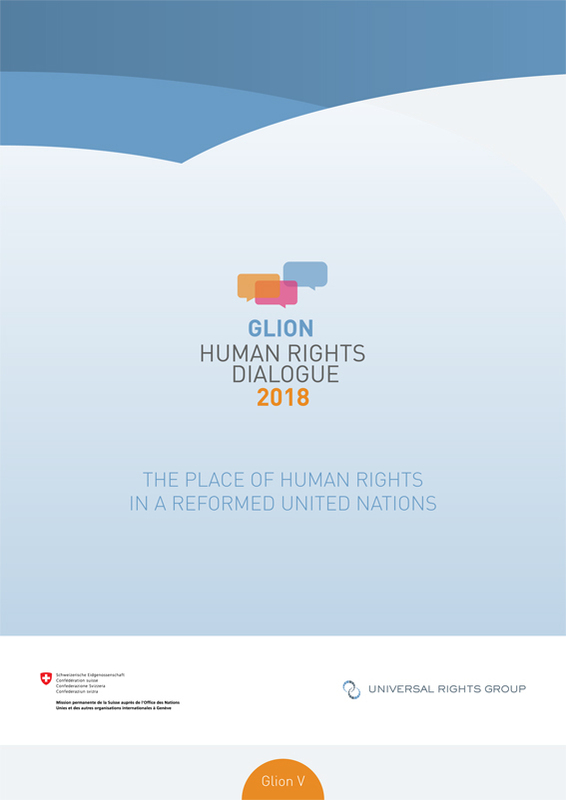 In particular, the Glion V retreat and its preparatory policy dialogues, looked at the human rights implications, of the ongoing UN reform process, launched in 2017 by the Secretary-General, António Guterres; and the parallel efforts of the Human Rights Council to strengthen its efficiency and effectiveness. The Secretary-General’s reforms focus on three key areas: management (secretariat), the development system, and the peace and security architecture. Through these reforms, the Secretary-General aims to create a ’21st century UN’ that is better equipped to address the complex contemporary challenges facing humankind. This means, in particular, reducing and eventually eliminating fragmentation between the UN’s three pillars (i.e. development, peace and security, and human rights), and striving for a more flexible and efficient Organisation. Notwithstanding the goal of reducing fragmentation between the three pillars, the current process of UN reform appears to primarily focus on just two of those pillars. This has led to a debate over whether human rights have been sidelined in the reform process, or ‘mainstreamed’ across the three reform streams. By seeking to understand where and how the human rights pillar fits within the Secretary-General’s proposed reforms, and also the implications of those reforms for the promotion and protection of human rights around the world, Glion V sought to support the Secretary-General’s efforts, and to contribute to the realisation of key objectives, including, inter alia: securing greater UN systemwide coherence, a heightened focus on prevention, and coherent support for the implementation of the 2030 Agenda for Sustainable Development. The meeting was premised on a conviction that each of the three pillars of the UN is of equal importance, and that all three pillars are interlinked and mutually reinforcing. In the field of prevention, for example, which is seen as a key focus of the proposed reforms, H.E. Mr Zeid Ra’ad al Hussein, the High Commissioner for Human Rights, argued during the opening session of Glion V that ‘prevention, like sustaining peace, is a human rights agenda.’ Consequently, the Secretary-General’s objectives can only be fully realised if the human rights pillar works hand-in-hand with the development pillar to build national human rights resilience; and with the peace and security pillar to ensure that emerging crises are identified and addressed at an early stage, and thus do not evolve into more serious conflicts. Similarly, by strengthening the UN’s human rights architecture, and promoting the implementation of States’ human rights obligations and commitments, the international community can make a major contribution to the realisation of the 2030 Agenda for Sustainable Development. Indeed, a recent study by the Danish Institute for Human Rights demonstrated that over 90% of the Sustainable Development Goals (SDG) targets are directly anchored in international human rights instruments. In parallel to the Secretary-General’s broad reform plans, member and observer States at the Human Rights Council (Council) have been engaged in discussions on strengthening the body’s efficiency, effectiveness and impact. These reflections, in particular those driven by Dutch-led discussions and Bureau-led consultations, include proposed actions in the short, medium and longterm to improve the work, efficiency and delivery of the human rights pillar, particularly the Council. Moreover, the next intergovernmental review of the Council’s status, which will decide whether it should become a main body, or remain a subsidiary body, of the UN, is due to take place between 2021 and 2026. Glion V provided a platform for UN member States, the President of the Human Rights Council, senior UN officials (including the High Commissioner for Human Rights and the Assistant SecretaryGeneral for Strategic Coordination), Special Procedures mandate-holders, NGOs, human rights defenders, academics and others, to consider these questions and issues. The retreat adopted a bottom-up approach, focused on identifying ways to strengthen the on-the-ground delivery and impact of the international human rights system, both in its own right and as a key pillar of a reformed UN. As with all Glion Human Rights Dialogues, the informal and inclusive discussions at Glion V, held under the Chatham House rule, aimed to generate new thinking and new ideas, to boost mutual understanding and bridge differences. Finally, Glion V sought to complement and contribute to existing processes, including those focused on Council strengthening and efficiency, as well as to provide useful analysis and ideas for the incoming High Commissioner for Human Rights.